I do have a garden growing in the backyard, but, the yield has been spotty at best. We are talking like one green bean per day, a few snap peas here and there, shabby chard and broccoli that flowers before I get a chance to eat it. The tomatoes are coming along, but, they are still green. Oh yeah, and peppers that are at a stand still. Honestly, I have had better luck accidentally growing peppers in the refrigerator by leaving them in the vegetable bin too long. (that phenomenon is called “internal proliferation” and for you fellow food geeks, there is an explanation of it here. So, even though I planned on making myself some killer homegrown salads this summer, so far, not happening. Thus I settle for a “refrigerator salad.” My herbs are doing well though, so I try to treat the basil like a “green.” I do always have on hand a few salad staples and they make for a hearty, healthy side dish or as a base for some fabulous protein topping (i.e. salmon or tofu.). If you have leftover of the salad, it can be used as a stir-fry base as well. 1. Bring a medium size pot of water to a boil. 2. Prepare an ice bath to submerge the vegetables in after boiling. 3. While waiting for the water to boil prep all vegetables. 4. Once the water is boiling, throw in the snap peas for roughly 1-1 1/2 minutes, then remove with a slotted spoon or strainer and submerge into the ice bath. 5. Repeat with the broccoli and carrots. 6. 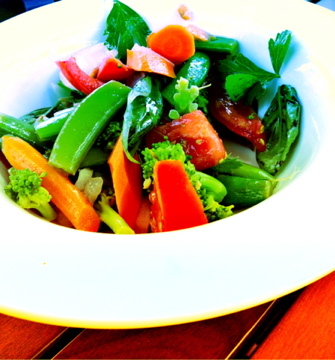 After all the vegetables are blanched, toss everything into a bowl, drizzle with some sesame oil and red wine vinegar. 7. Add the herbs and salt to taste.